Why Leaving a Review is So Important to Us! Did you enjoy your time with our Minneapolis area dentists at Serene Oaks Dental? We value your opinion and strive to make sure your experience with us is a positive one. The success of our practice is enveloped around our patients’ feedback, which is why we would love to hear your feedback through online reviews. Why should you write us a review? People instantly go to the Internet to search throughout the Minneapolis area for dentists, and they rely on reviews to get a personal glimpse of other people’s experiences. We love helping the community by offering exquisite services, and your feedback is influencing potential patients to achieve that healthy, beautiful smile from our skilled husband-wife team. Plus, reviews help us gain better search results, making it easier for potential patients to find us! Where can you write a review? How do you write an online review? What did you like most about the product? Would you recommend us to friends, family, and colleagues? Your feedback impacts our practice and we would love to hear it. 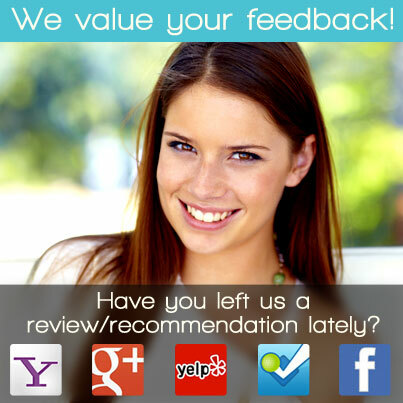 Please write us a review and let the community know how we can give them the healthy, beautiful smiles they all deserve!